Photo: Wakx. Creative Commons BY-NC-SA (cropped). A European Union decision to give consumers more information about the food they buy could mean good news for tropical countries whose forests are threatened by the expanding trade in palm oil. Palm oil is found in 50% of supermarket products, such as soaps and shampoos, and in many sorts of food. But the EU requirement that food products containing the oil must now be labelled clearly should help to dispel doubts about the damage it can cause. Producing the oil often involves felling virgin rainforest, reducing biodiversity and destroying the habitat of endangered species such as orangutans, elephants and tigers, and ruining the livelihoods of local people. It also involves the release of large quantities of carbon dioxide into the atmosphere when carbon-rich tropical forests are cleared for plantations. The EU move is not expected to change things overnight. Simon Counsell, executive director of the Rainforest Foundation UK, said: “We imagine that the impact in the short term will be fairly limited, as it’s hard to see busy people scanning through a long list of ingredients on manufactured foods to see if the product contains palm oil. Indonesia and Malaysia produce 85% of the global palm oil supply, and wholesale logging there is a direct threat to some of the last remaining habitats of orangutans. There are thought to be around only 60,000 surviving in the wild. Elizabeth Clarke, business and biodiversity programme manager at the Zoological Society of London, said: “Palm oil production is vital to the economies of countries where it is grown, but it also has serious negative environmental impacts, particularly if grown unsustainably. “We are working with the industry to promote sustainable practices and responsible investment through our new Sustainable Palm Oil Transparency Toolkit, SPOTT. New areas face threats in Africa and Latin America. In the Congo, for example, a million acres are already being cultivated for palm oil, with a further 284 million acres of pristine rainforest currently at risk. The Congo contains the world’s second largest tropical rainforest — after the Amazon — and is one of the most important wilderness areas left on Earth. Many people living in the forests feel powerless. Chief André Sayom, head of the village of Nkollo, in Cameroon, told the Rainforest Foundation: “We don’t have any space left to farm. We don’t benefit from anything. We’ve been displaced more than once already. “Life becomes very difficult when these multinationals set foot somewhere. These projects need to be looked at in the long term, and populations need to be informed and consulted”. The new EU rules, introduced last December, require companies that use palm oil in their food products to label them with an explicit statement, rather than simply relying on vague, catch-all references to “vegetable oil”. They can also now highlight their use of certified sustainable palm oil. Unilever is one of the world’s major buyers of palm oil, purchasing around 1.5 million tonnes annually — about 3% of global production. It promised that all the oil directly sourced for its European foods business would be 100% traceable and certified sustainable from the end of 2014. 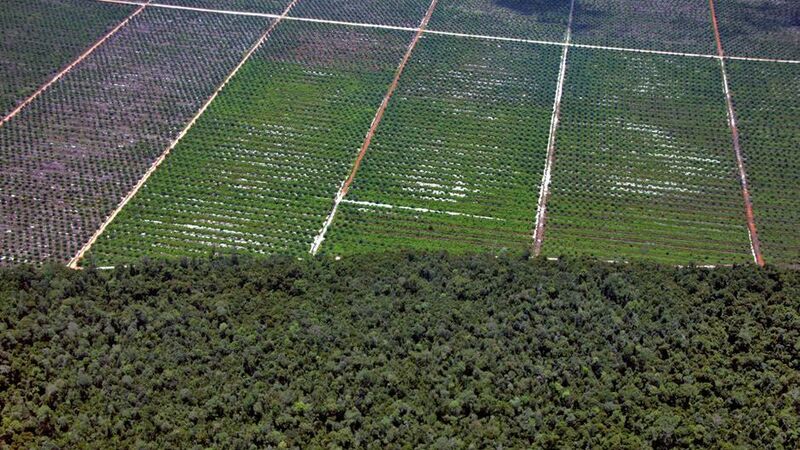 Palm oil production is big business. The industry is worth $44 billion, with the world consuming 55 million tonnes in 2013 − nearly four times the 1990 total. And the World Bank expects today’s global demand to have doubled by 2020. The Climate News Network allows free reproduction of their articles. Ruth Evans is a London-based writer and broadcaster on food and the environment.